the Peony is coming through the ground, this was a gift from my neighbour many years ago it never did very well until i cut back a white hebe that had outgrown its use and the last few years its just got better and better, its a beautiful red when in flower. The catkins on the Corkscrew Hazel are nearly finished now but still make a nice photo. 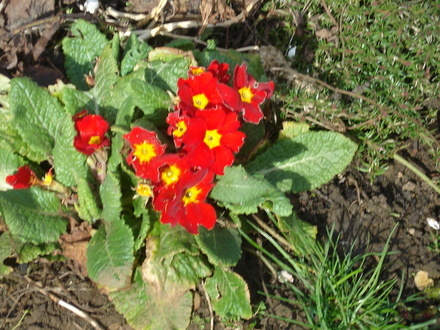 The Primulas are coming into full flower although a few have been nibbled by snails! I have moved the bird feeding station as the birds don’t seem to be using it don’t know why, they have before am wondering if Toffee or one of the other cats has frightened them too many times, i have moved to a border further from the window and near some shrubs so the birds have somewhere to perch in safety, fingers crossed they appreciate it!! As you can see the temperature is a bit different from the last time i posted a photo of the gauge!! All in all i had a very nice day, i planted my cherry tree near to the shed, sowed some more seeds, cosmos, candytuft, california poppies and the poppies i got from Jacque, feel contented and tired! Next post: roll on summer! What a lovely afternoon you have had Sk.Think the birds will appreciate their new spot ! Good to see everything peeking out of the ground now ! Sewing....Does the corkscrew hazel take several years before it produces catkins? I have had one in a very large pot for 4/5 years now and it has never had any on it, although it always has plenty of leaves and is healthy. liked the blog. 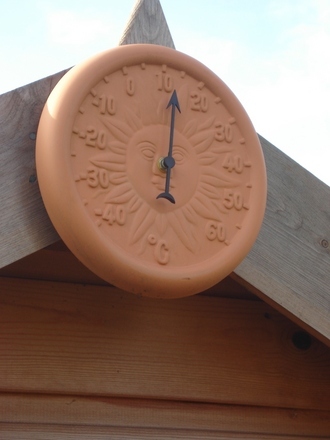 when i leave in the morning it is rarely sunny but by mid morning i am fretting in case greenhouse is getting too hot. loved the pictures. 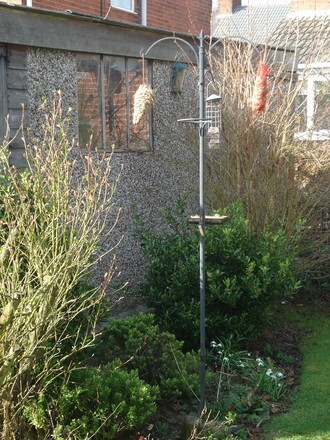 Had to move some of my feeders a while back Sewing and pleased to say within a few days the birds had found them again. 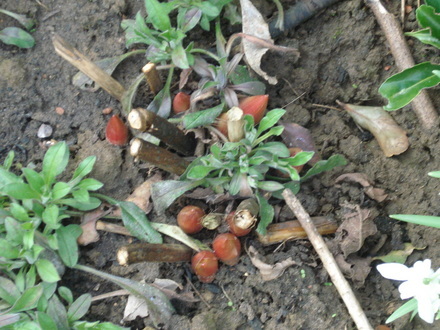 Have also been out in garden and know that contented feeling,like your blog and photo,s. Lovely. I enjoyed being in your garden in the sunshine. What a beautiful blue sky! Ours has been absent for ages - it's grey today, too. Never mind - it is definitely warmer and yes, I'm getting things sorted! Sad, though, to see what I have lost in the cold. 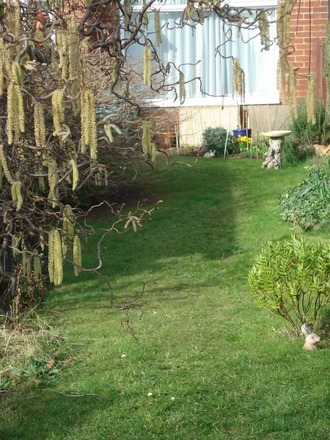 My baby corkscrew Hazel is fine - it had two catkins - but my contorted willow really suffered and I have spent several hours cutting out the dead bits. Great blog. 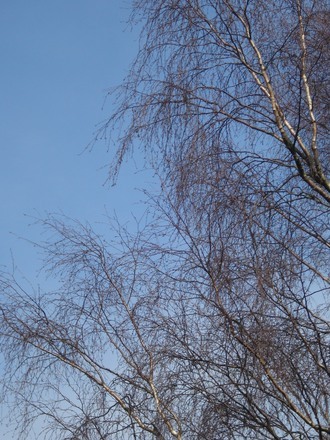 A bit of blue sky encourages us all in to the garden.Fingers crossed for lots more blue sky this spring!